Our waterhole has a lot of activities at the moment. Many Hippos and Hyenas are coming to drink at night. 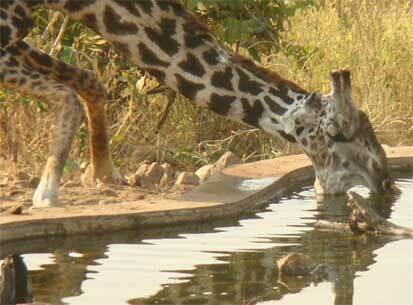 Also our local Giraffe (George), Elephants, Impalas, Old Buffaloes and Waterbuck are drinking during the day and at night. Baboons and Warthog are day drinkers. This morning about eight of our guests were having breakfast at the Eagle’s nest. After their breakfast they stayed in the lounge waiting for the plane to come because they were leaving. All of a sudden I saw Onno running to the office and Heribert was looking at the water hole where there were some Impala shouting. I asked him what happened and he told me they have seen some dust and an Impala started to shout. 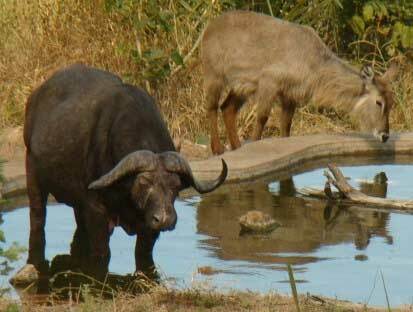 Then Onno came back with binoculars and both him and Heribert went closer to the water hole. I remained with the guest. As they got near to the waterhole I saw something jumped and the dust came up. They told me that there was a Leopard that killed Impala. As I was showing guest where the kill was the Leopard dragged it to the bushes and we didn’t see him again. So exciting!! Just after our dinner we heard many Hyenas calling as if they had killed something. After that three Lions started to roar. I worked out that the Hyenas went crazy because they saw these Lions. So they were trying to chase them away because of food competition but it seemed it didn’t work because they were male Lions. I didn’t sleep well that night because they kept waking me up as they were roaring because they came near to the camp. In the morning at the staff village we saw their tracks. This entry was posted in Salum, Wildlife and tagged Beho Beho, camp, giraffe, leopard, safari, salum, selous. Bookmark the permalink. Don’t use up all the good stuff, before Heather and I get back to Beho Beho in early October! !